Justrite safety faucets and extensions, brass gate valves, brass barrel faucets, drum faucets, and drum valves. Faucets shown below are for use with flammable liquids. Please see our Faucets page for other faucets. Additional drum equipment is available on our Cradles, dolly, lifters , Drum and pail heaters , Drum deheaders, funnels , and Drum pumps pages. 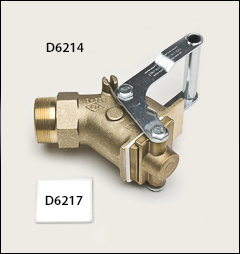 WARNING: Proposition 65 Label for all faucets and gate valves shown below, except the D6210. FM approved self closing faucets with Teflon seal and internal flame arrester. 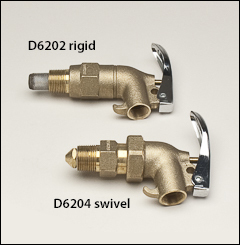 The swivel-mounted faucets, available in brass or stainless steel, allow you to screw the faucet into the drum to the correct tightness and then adjust the spout to correct position. Simply loosen swivel nut, position the spout, and tighten the nut. It’s fast, eliminates thread damage, and prevents hazardous leaks. 6" flexible faucet extension, in brass or stainless steel, prevents spills. provide extra accuracy and prevent spills. Heavy-duty self-closing valve. Safe efficient dispensing of viscous flammables such as adhesives, resins, paint, and heavy oils. Easy leak-proof threading into the 2" bung opening on a drum. Brass and stainless steel construction provides corrosion resistance and minimum maintenance. Large pour spout permits fast flow of heavy liquids. Instantaneous flow cutoff is provided by a knife-type action when spring-loaded handle is released. Messy, hazardous spills are eliminated. Guard over spout minimizes the risk of hand injury. FM approved, meets OSHA regulations. Replaceable Teflon blade available. 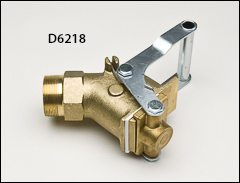 2" brass valve with heavy-duty self-closing valve provides a cut-off of flow to prevent spillage. Designed for handling viscous flammables. Replaceable gate blade between body and shoe. 2" threads, 1 3/4" opening.